Terradyne! In the 22nd century, the mighty interplanetary conglomerate is the unchallenged ruler of extraterrastrial space. Its only rival for control of the solar system is the UPOE, the global government of the teeming and environmentally-threatened Earth. 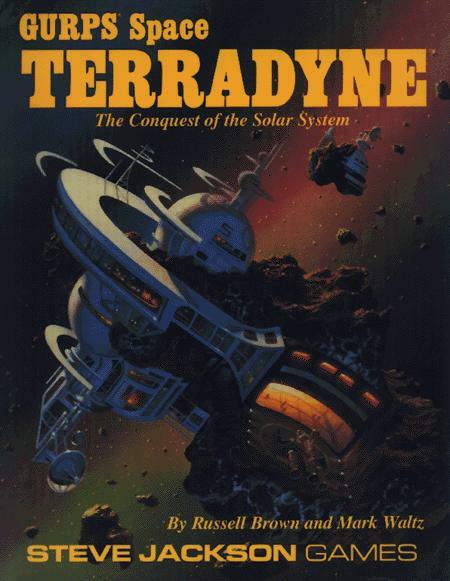 Will Terradyne use its economic and technological superiority to save Earth, or destroy it? GURPS Terradyne is a detailed and realistic setting for exciting near-future roleplaying with GURPS Space. Tame the savagely-awakened terraformed planet of Mars . . . engage in high-powered industrial espionage in Terradyne's sub-lunar headquarters . . . foil smugglers and saboteurs on the mines of Mercury or the moons of Saturn . . . try to survive on an ever more crowded and desperate Earth . . . or help mankind make his first tottering steps towards the starts! With GURPS Terradyne, the whole solar system becomes an adventure setting! GURPS Terradyne includes detailed descriptions of 22nd-century interplanetary society – technology, government, economics, etc. – plus maps and descriptions of the important planets and moons of the solar system. From the Martian frontier to the edge of interstellar space, GURPS Terradyne is your guide to man's greatest adventure.